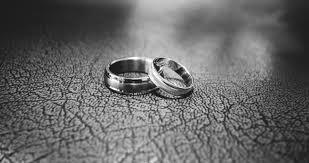 When we talk about wedding bands, most people turn their thoughts toward the bride, but what about the groom’s wedding band? He deserve special attention on his wedding day, too. In this article, we will discuss everything you need to know about groom’s wedding bands. Although the thought is anything but romantic, it is wise to establish what you would like spend on the groom’s wedding band before you begin the process of picking it out. This will make things much easier and probably eliminate some frustration. Sterling Silver bands will run in the $30 to $100 range. While contemporary metals run in the $100 to $600 range. If you are looking for gold, the 14kt band range is $500 to $1,500 and the 18kt band range is $900 to $2,000. Platinum bands will run you $1,800 to $3,000. This pricing is for carved and plain bands only. If you would like a band with gemstones there will be an additional cost. It has been said that the groom’s ring should be 1/5th the cost of the bride’s engagement and wedding ring set. But, don’t let that limit you if your budget allows for more. There are a lot of great options out their in the world of men’t bands. It is important to take lifestyle into consideration. Does the groom have a hands-on job or perhaps he works in an office environment? Do his hobbies involve machinery or doing things that will be hard on metal? These are all good things to think about because some metals withstand some abuse. Talk with a jeweler at Oletowne Jewelers to discuss which metal best suits your lifestyle. You will be glad you did. It goes without saying that the wedding band is a ring that the groom will be wearing for many years to come. So, it better be something that matches his personality and style. It’s true that a lot of men choose rings that are plain, but it isn’t complicated to dress it up a bit. Truth be told, you can dress up a groom’s wedding band without making it look complicated or overstated. Some grooms even choose to add a stone to their band to add some flare. A diamond is a nice touch. Whatever you choose. The professional jewelers at Oletowne can help you come up with a design that will match your personality. That’s right, the bride and groom go together so it only makes sense that their bands should compliment each other as well. While we aren’t suggested that the rings are identical, it is suggested that the rings work together and are similar in style, metals, etc. The overall look of both rings should be complimentary to one another. Preparing for a wedding is so exciting and buying wedding bands is just one more exciting part of the process. We hope that these tips help you along the way. Please stop by Oletowne Jewelers and let us guide you as you make these important decisions. And, feel free to visit our website for more information on the services we provide.